Splash pages, you gotta' love 'em. A blank canvas where the artist can hit the reader with a large dose of illustrated 'wow'. This week, the splash-ending to my first ever Spider-Man comic, the John Romita (Junior and Senior!) 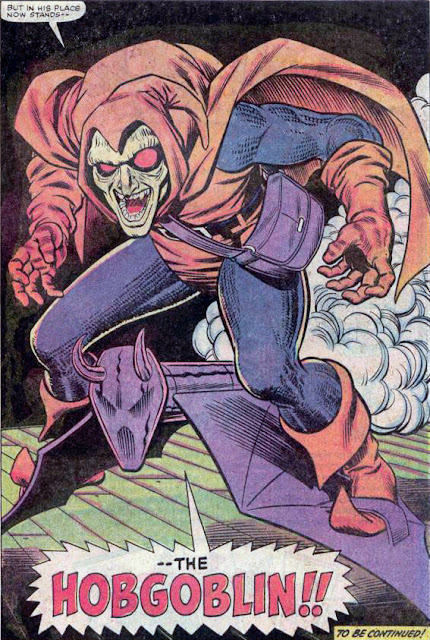 masterwork that is The Amazing Spider-Man #238, and the first appearance of this here chap, the Hobgoblin. Two things stuck after reading this issue. What on earth was an "egg creme" (Pete, Aunt May and her bf at the time Nathan, were going to celebrate by eating one), and that Hobby was one fresh'n'evil dude. Yeah I know, Green Goblin was first, and while his name was chucked around as Osborn's looted weaponary changed hands - this was my first Spidey book, so Hobster was 'all new' to me. Romita Snr is now my definitive Spider-Man artist and his son is one of my top artistic influences, so a few addictions were introduced in this issue. No one has captured the Hobster's snaring mug as good as this since either (partly why it's up in the IADW masthead)! So, what was memorable about your first introduction to Spider-Man? Well I wish they'd take whatever they used to dust him up and do it to a few more of their Pantheon at Marvel. If you're going to bring somebody back, that's the way to do it. What a gorgeous spash page that is. 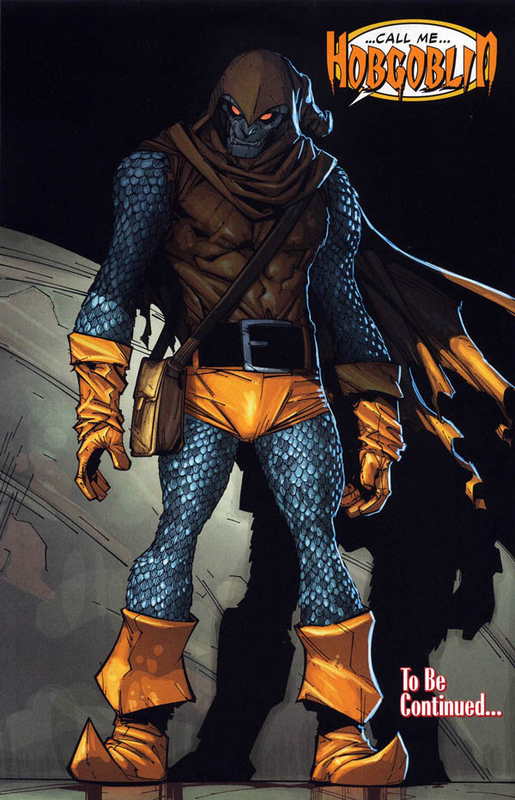 Now if Harry had looked something like this in the 3rd installment of the Spider-Man series....well it still would have sucked but maybe not quite so badly? I remember Peter Parker being madly in love with Gwen Stacey. And then suddenly she was dead. Yep. That was how I remember being introduced to Spider-Man. And who was that uppity red head that wanted to take her place? I'm telling you, I did not like Mary Jane Watson for a long time. But yeah, that's a great way to redo the Hobgoblin, I agree. He looks great. The Tom DeFalco/Ron Frenz run was one of my favorites, although what I've read of it was long after the fact. I have a good deal of those issues now, although ASM 238 is one that I'm still missing. I used to read random issues of Spider-Man that my friend bought, but the ones he got were a few years old at the time. Mostly he seemed to get the late-80s "crime era" issues, the ones with lots of Kingpin and Black Cat, which I loved. The first brand-new one I actually bought for myself was Spectacular Spider-Man #226...which is the issue where Peter Parker quits and Ben Reilly takes over as Spidey! Needless to say, I was pretty shocked at the time. Now when I look back on it I actually think it's pretty funny. I'm glad they didn't revamp the costume too much Craig. Allot of Spidey's rouges have needlessly had their classic outfits chucked in the shredder - glad to see Hobby didn't share that fate! Ya know what RN, I have yet to read a Gwen-era book, but when I think Spidey's Girlfriend it's still her I think of first. MJ did a good job in advancing fictional redheads of appearances in leading roles though. We were getting tired of the flag bearer being Daphne from Scooby Doo. Marc, I loved the crime era too. Especially Peter David's run on Web of Spider-Man with the Black Cat, Black-suit Spidey and The Rose. Those were amazing issues. I liked Ben Reilly, not as Spidey but as a character. He just had quite an interesting and fleshed out vibe to him. It was sad he couldn't move on in some other way after that whole era was over. If you get 238 be sure to let me know what an egg creme is too if you find out! Its nice to hear Marc say he liked the DeFalco/Frenz run because that was an important one for me (I also like DeFalco's run on FF), it was coming out when I was around 12at the height of my Spidey fandom, and every month there were teases about Hobby's identity. I confessed a while back even that, probably due to sentimental attachment to that era, I prefer Spidey's black costume (non-Venom version), something I only realized about myself a while ago. I agree Aaron. There's something sleek and clean about it. A bit more realistic too. Swinging around New York in red and blue undies...okay, if you're going to do it, that's definitely the city to pick. An Egg Cream is a New York thing, I guess. It's just milk and chocolate syrup and soda water from a fountain The milk + soda water combination gives it a frothy foam at the top. It's interesting in that it contains neither eggs, nor cream. I'm not a fan, myself. But I definitely am a fan of Amazing Spider-Man 317, my personal introduction to Spidey! Thanks for that Tom, I have to say the ingredients don't do anything for me - but hey at least now I can die an educated man. Amazing Spidey 317 huh? What drew you in - Pete or Venom? And let me add my voice to yours Craig and Aaron - the black suited Spidey is by far my favourite Spider-get-tup. It's clean, sleek, and simple, and in the hands of the right artist still an invincible pair of crime-fighting togs!! 317 was among the books my parents bought for us when we went on vacation on summer, and it read it end to end a bunch of times; probably didn't hurt that the climax took place on a beach.